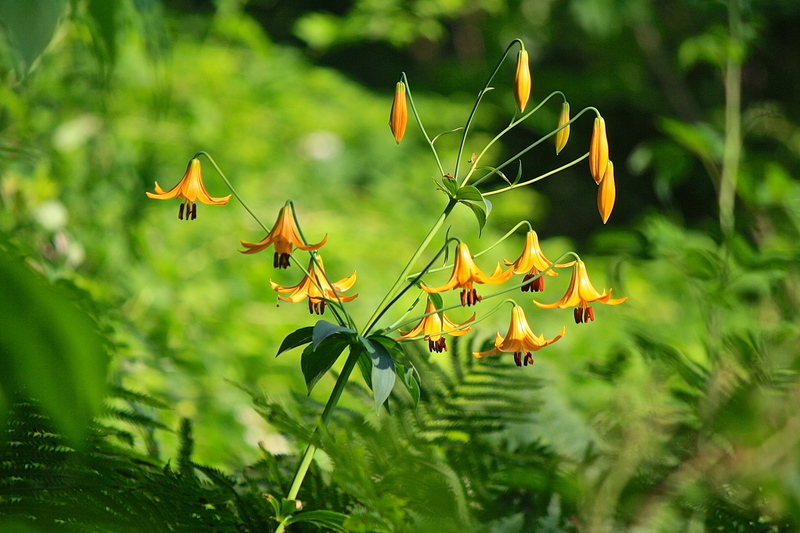 Turk’s Cap Lilies (Lilium canadense) are now at peak bloom in our woodland. Easily distinguished by their vibrant orange, recurved petals that earn them their name, their annual bloom is an eagerly awaited event for us. Native to eastern U.S., this graceful wildflower thrives in moist, well-drained meadows and woody thickets, flowering best in full sun with up to twenty blooms per plant. Our heaviest bud count this year is thirteen. Like many other cherished perennials, they bloom only for a short time in early summer. 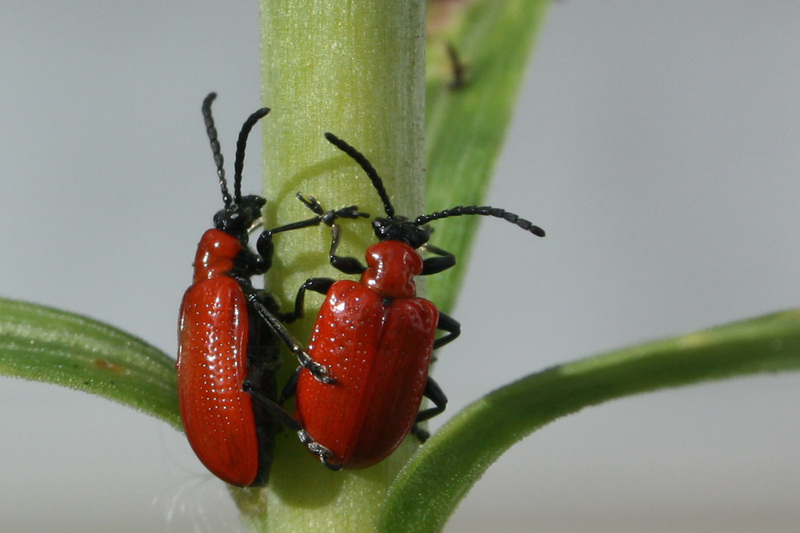 If they are not munched by deer, which find them a delicacy, or devoured by the noxious European red lily beetle (which is seriously decimating all our true lilies), they go on to form seed pods that resemble green hot-air balloons. In the fall, these pods turn brown and crack open to reveal stacks of winged seeds that are dispersed by the wind. Often, we will grab a handful to sow on our walks to help increase their number. Native plant nurseries offer bulbs for sale, but be warned, rodents love to eat them so to protect your investment, take precautions to discourage them from nibbling. Wire mesh baskets seem to be the easiest, longest lasting and least toxic method. Siting is very important – they cannot tolerate dry soil, preferring evenly moist, well-drained, neutral pH soil enriched with compost. As I mentioned before, full sun is best, although part sun is tolerable. Mulch well and underplant with ostrich ferns, which shade the bulb roots and complement this lily’s unique beauty. 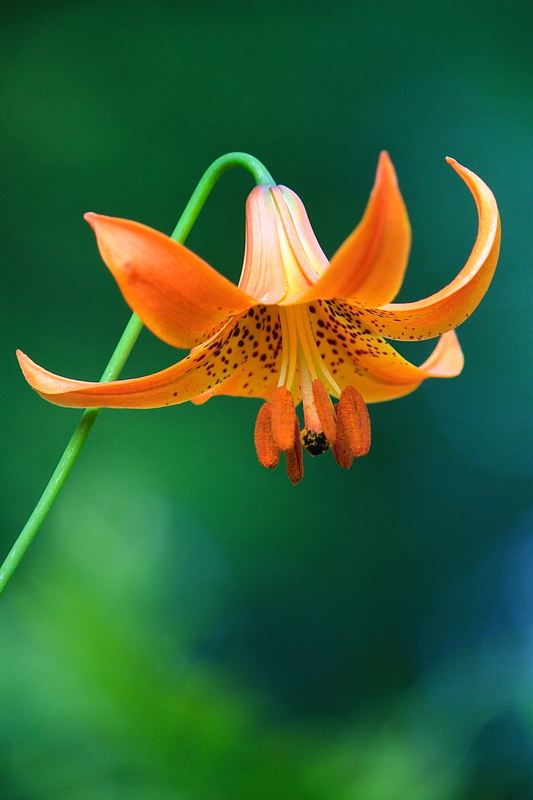 This entry was posted in Country Gardening, Field Notes, My Photos and tagged ferns, Lilium canadense, lily, native flowers, photography, red lily beetle, summer bulbs, turk's cap lily, wildflowers, woodlands. Bookmark the permalink. First I thought that these flowers do not grow here in Asian subcontinent, but when you mentioned pods with flying seeds, I remember my mother used to tell us about those. I think that was the same or some near cousin of these flowers. I imagine all lilies spread seed the same way, so yes, it may have been a cousin, indeed! Who doesn’t love lilies? Thanks for stopping by and commenting, Baad. Wow, your very first photograph is so striking! It reminds me of the chinoiserie decorative motif of the 17th century and the fanciful scenes on early 18th century french tapestries. I can just imagine that brilliant cap on a dancing figure on an early porcelain teacup. Fantastic! Thanks, Micheal. They do hint of the Orient don’t they? Heck, they do more than hint. They shout! Your photos are remarkable Eliza – particularly #1! Thanks, Dor. That one is my favorite as well. It is a darker color than the others and there was only one blossom on it this year. I will try to save its seed for propagation. It is right next to the path, so I’m crossing my fingers that the doe won’t find it! 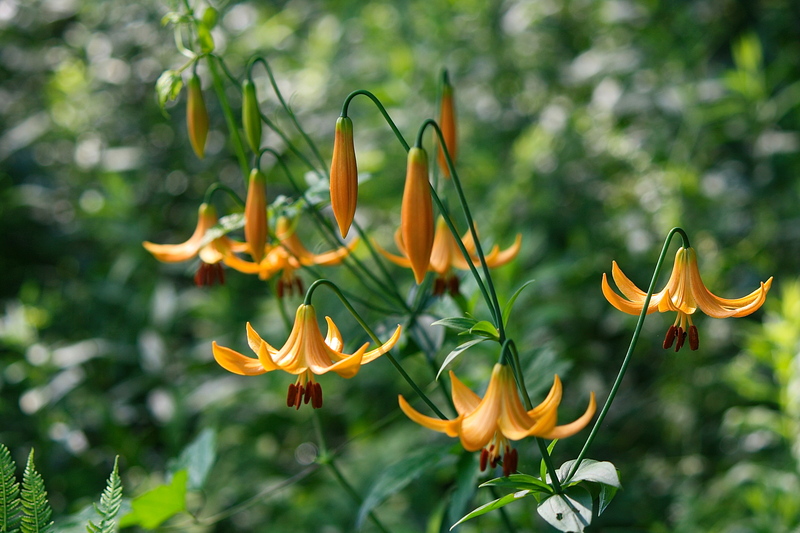 Wow – what fabulous shots of these lovely lilies! As always, Eliza. Simply beautifully done. I always learn so much from you!! I love how my knowledge of nature continues to increase as I read your blog. The first picture was simply stunning! The colors of nature resonate with us all. I love your picture. The blurred background is perfect to show this beauty! What a beautiful post, Eliza. I hope your efforts are successful in spreading the colony and bringing you more of these beautiful flowers. Thank you for the warning about the wire cages to protect the bulbs. Did you start these, or are they volunteers? Such a delicate plant 😉 Thank you for sharing. These are wild flowers, completely self-sown. I’ve tried growing martagon lilies, which are similar but are maroon, without any luck. They are very fussy about where they grow, so for now, I just enjoy them in the wild. With the price of beef rising, maybe more hunters will find this abundant protein source of interest? Deer populations have exploded within our lifetimes without predators to keep their numbers in check. My parents generation were hunters, but few want to hunt nowadays. Personally, I could never do it, but I see the need to keep balance. In NJ, where my in-laws lived, they were like lawn ornaments. The competition for food was causing winter starvation, resulting in the evolution of smaller deer, like in Japan. The state was employing sharpshooters to cull the herd, it’s been a while but I imagine the practice still goes on. Humans affect nature so profoundly and I wish more were aware of this. Bow hunters are allowed in our neighborhood during the season, and they donate their bounty to “Hunters For the Hungry,” an extremely worthwhile program. There is very mixed feeling about the hunting here, and my attitude has changed entirely since our first summer here. Any hunter is welcome to hunt from our property because the herds are too large- for all of the reasons you mentioned. It is a very practical solution to the problems of urban hunger, and a fine alternative to the meat industries. I’ve maintained a vegetarian diet since the mid-80s, and believe that the industry, as currently operated, is not only cruel to the animals, but a major source of environmental pollution. We hear all about “carbon emissions,” but no one wants to talk about the methane generated by the meat industry. Since I haven’t given up many dairy products (like butter) I have absolutely no right to comment, however. You are right about how much humans impact the environment, and how unaware most remain of the impact of our actions. Thank you so much for sharing that, I’m glad you enjoyed it! Love the delicate Turk’s Cap lilies! Each photo holds its own beauty!